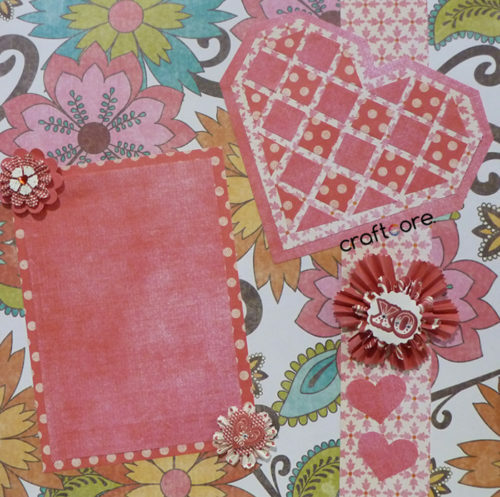 Today I’m going to show you how I made this adorable heart embellishment out of scrapbook paper. 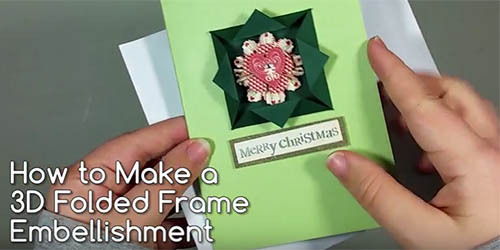 It’s a perfect addition to your Valentine’s Day cards or scrapbooking layouts, but you could use it any time of year. Hearts are so versatile! This design was inspired by sewing and quilting. I’m obsessed with half square triangles in quilting, and I thought the design would translate beautifully over to paper as well. Wouldn’t this also look cute with some holes punched around the perimeter with yarn woven through as if it were hand quilted?! The approximate size of the embellishment will be 6 inches wide by 5.5 tall, depending on how much you space out your pieces. 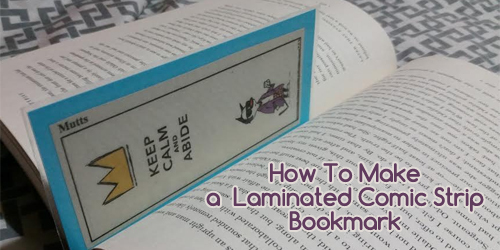 Use a paper cutter to cut out two different patterned (but colour-coordinating) strips from a 12×12″ piece of paper, three quarters of an inch wide each. Cut down those strips into three quarter inch squares. You’ll need 10 squares total out of each print to make this heart shaped design. 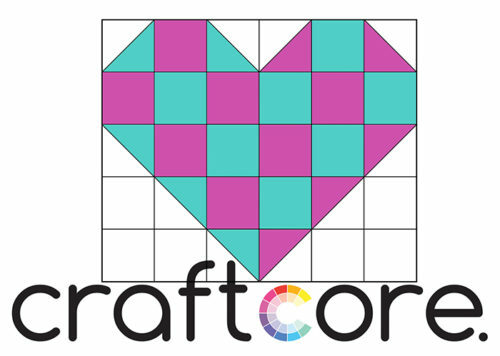 Cut 3 squares of each colour diagonally in half – you’ll have 1 half triangle leftover of each print. You’ll need 5 triangles total out of each print. Start laying out the squares in grid formation as per my layout guide graphic, alternating between the two colours. 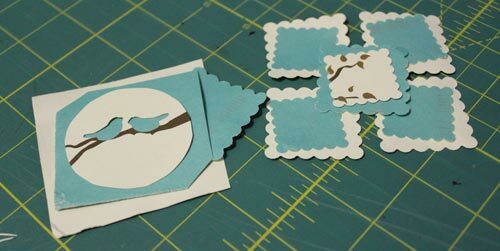 Stick them onto a fresh piece of paper using whichever adhesive you like; I’m using Herma adhesive squares. Paper Layout Guide: blue represents print 1; pink represents print 2. You could mount the squares flush or leave a little gap between all the pieces like I’m doing. Your choice! Start in one corner and work your way out, following the layout above. Once you trim off the excess paper, your heart is ready to be attached to the project of your choice! This design is based on 0.75″ squares. If you want a bigger heart, cut out wider strips. If you want a smaller heart, cut out smaller strips. The smaller you make them, the more fiddly your pieces will be, so be careful! I decided to use my heart embellishment to prepare a scrapbook page for Valentine’s Day. I created a simple layout by creating a double mat for a 4×6” photo, a band of paper as a border on the right side, and a few peel-and-stick embellishments. With the patchwork heart, I think the page is quite charming. Once Valentine’s Day comes, I’ll be ready to print out a photo and add it to my page. Easy as pie. 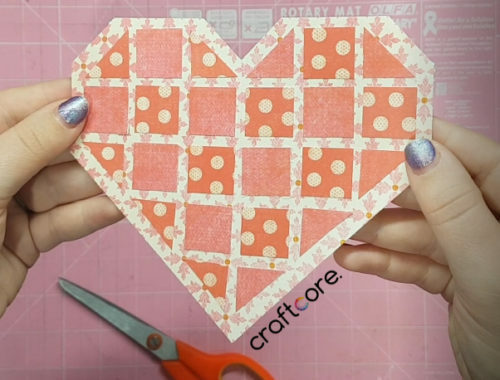 I hope that this tutorial has inspired you to make your own patchwork heart embellishment. If you prefer to see the action rather than read about it, be sure to check out my YouTube video tutorial, embedded here for your convenience.